“Apart from the glasses we have something else in common,” is my opening sentence. Swan Lake and other iconic pieces, such as The Red Shoes and Car Man, a take on Bizet’s Carmen. As I was beginning my training Matthew had left two years previously and launched his dance company New Adventures, which is currently celebrating its 30th year. And to mark their anniversary, Matthew has been touring the UK with his show Early Adventures, showcasing a few of his first ever dance pieces that helped launch his career and saw the birth of the style, wit and sheer entertainment that have become hallmarks of the New Adventures company today. But it’s that fearlessness and his ‘oddness’ that has continued to fuel Matthew’s success in the dance world. Matthew is what you would call a ‘thinking dancer’, there’s no ‘kick your legs and smile girls’ approach with this chap. and expelling expletives if things didn’t go to plan. 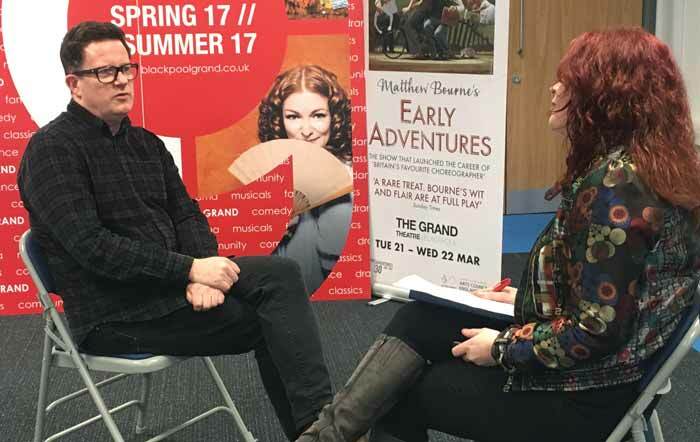 Karen chats to Matthew Bourne at the The Grand, Bloackpool. When it comes to choreography all the dancers also have equal input, “I want the best idea in the room,” says Matthew, “and I don’t care if it comes from someone who’s been there ten years or ten minutes. If they’ve got a good idea and the courage to say it, all input is welcome. The age gap has grown a lot over the years as I’ve got older, the young ones who come in now can be a bit nervous of me and I have to break them down and become their friend so they feel they can contribute and I will listen to them. It’s important that they feel they have ownership on the piece. Renowned for his theatrical performances, Matthew has received critiscism from dance critics stating he’s more a director than a choreographer. So, does Matthew see himself as a director that choreographs or a choreographer that directs?